This variety is popular for its attractive apples. The fruits are large and red/orange striped making them a feast for the eyes. 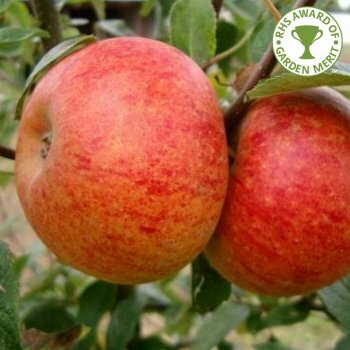 Apple Charles Ross is sweet and juicy and well suited to Northern areas or limy soils. These large apples crop in October. For the best out of your Charles Ross apple tree ensure that there is a pollination partner within a half mile radius in group B or C.
Charles Ross is in pollination group C and requires a suitable pollinator within a half mile radius. Apple trees should be spaced according to their rootstock, for example an MM106 (semi-vigorous) rootstock will require approx. 4.5 metres between trees, whereas an M27 (very dwarf) rootstock will require approx. 1.5 metres between trees. Pruning young apple trees for the first few years after planting ensures a healthy, goblet-like shape. Your tree should have one central leader and several side shoots. Straight after planting, you can remove the lowest laterals. Prune back other branches by between a third and half their length.